I enjoyed this article on why sensory play is important for preschoolers. What a great idea of freezing treasures in ice to encourage discovery in your small child from Counting Coconuts. An informative post by Mommypotamus on why certain bacteria are actually GOOD for you and why you need them. A fun OCEAN themed sensory bath that I KNOW I would have just loved as a kid. Another gem to tuck away for later. I really enjoyed this hippie/crunchy to do list because I felt like I won something when I went 5/5. This month I learned to clean my face with oil, and despite sounding counter intuitive, my acne cleared up considerably. I’ve tucked away this recipe for homemade GAPS friendly chocolate. I found this great resource site for local grass fed meat, eggs, and dairy. Check out this article about ditching chemical-laden toilet paper from Sarah, the Healthy Home Economist. This post from Actual Organics about earthing and getting back in touch with the earth. Mama Natural tells the story of the Switch Witch and how to reduce your kids’ consumption of Halloween candy. 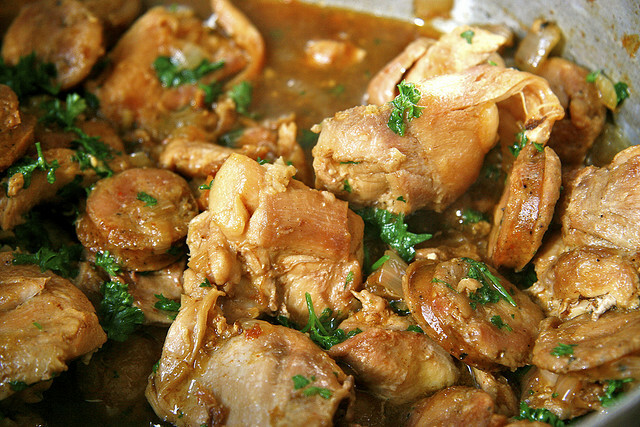 Nourishing Joy posted a scrumptious looking chicken stew with 40 cloves of garlic to kick cold season to the wayside. This Chile Relleno Egg Casserole recipe from Too Many Jars In My Kitchen made me realize how much I’ve missed Chile Rellenos. I’ve got to make it now! I am so excited that I found this recipe for grain free chocolate wafer icebox cookies from Homemade Mommy. I’ve been looking for a good gluten free recipe for the “sandwich” part of ice-cream sandwiches to pair with my raw milk ice-cream for forever! I love almost anything curry, and kale is so good for you; this simple recipe for thai curry kale lettuce wraps from Honest to Goodness Living really caught my eye. From Mama Natural this month: this delicious pear pudding recipe and this hilarious new hey baby meme! I really enjoyed reading this informative discussion on polyunsaturated fatty acids by Butter Believer. And lastly, I found these amazing paintings of maternity and birth done by Chantal Handley. Just breath-taking. send me an e-mail if interested. Thank you!